« François Schuiten: "Il va falloir repenser cet égout à voitures qu'est la ville"
The second English language volume in French/Belgian team Benoit Peeters and François Schuiten‘s The Obscure Cities series, this was recently revived through a Kickstarter campaign by Alaxis Press, but IDW has partnered with them to complete the entire series, only a few titles of which have ever been translated. 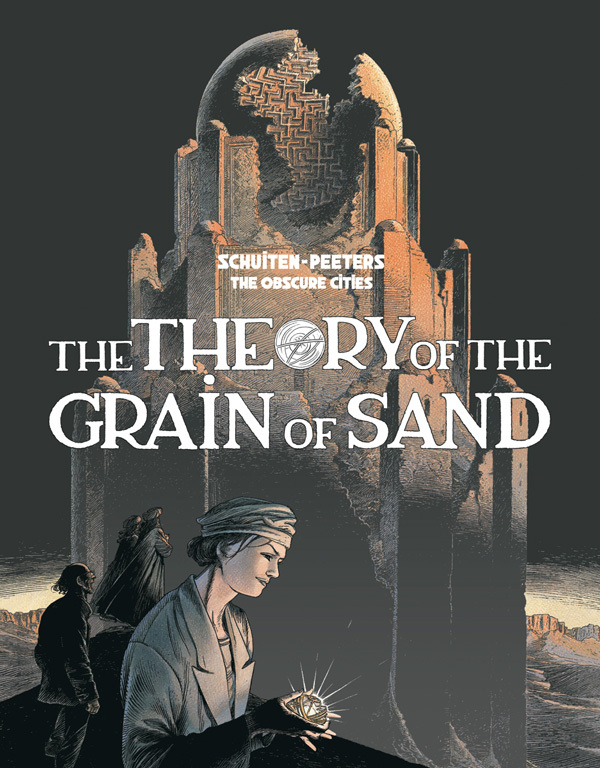 The Theory Of The Grain Of Sand works as a direct sequel to the previous release, as well as a strong standalone, reveling in the same mystical quirkiness, half science fiction, half impossible-to-catagorize fantasy. In The Leaning Girl, an incident while traveling with her family leaves you Mary Von Rathen leaning in one direction and sends her on a journey involving a sideshow and a pioneering scientist who believes Mary’s condition has to do with a nearby distant sphere and the pull of its gravity. The tone is a contemplative one and the story revels in its strangeness as it examines concepts of alienness and the need in humans to find a place to be. Mary returns in this volume, but is only one part — though an integral one — of a larger story that sees the city of Brüsel falling victim to several strange happenings that are absurd as they are mysterious. One resident has a series of stones appearing in his home and piling up so much that the building itself is in danger of collapsing. Another becomes so light that he begins to float away. Still another person finds more and more sand appearing in her home, with no idea how to dispose of it even as it overtakes the living space. All these circumstances coincide with a visit to Brüsel by Gholam Mortiza Khan a Bugti warrior who is hoping to sell a necklace taken from a Moktar leader during war, and leaves it for verification with Elsa, an antique dealer dealer. Events conspire as such that the warrior doesn’t return to pick up the from Elsa, and as the scattered events eventually become big concerns for the larger community, Mary returns in order to investigate and solve the problem. Now grown-up and an investigator of mysterious phenomenon, Mary approaches the case with the theory of the grain of sand in mind, the idea that one tiny detail can be changed and it will disrupt everything. She’s right, but in context of human knowledge, the cause and effect of the tiny detail, what it actually does to Brüsel, is curious and absurd. If The Leaning Girl was almost like a philosophical parable masquerading as dark children’s adventure, The Theory Of The Grain Of Sand is a more straightforward tale of cultural plundering. The greed, spurred on by curiosity, that white Europeans can exhibit towards other cultures is plainly being addressed, as is the insistence on cultural ignorance about the particulars of the cultures being plundered and the specific circumstances of the treasures themselves. The payback for these actions that Peeters enacts on his characters are of shifting proportions — something is added, something is taken away, and with either action, the reality becomes all too much. Mary, inspired by her own brush with the weird, approaches the mystery with a calm that is almost off-putting to the other characters, but it’s a testament to the enlightenment that can result when one is a victim of the unknown. It’s an enlightenment that Constant Abeels, the man who is burdened by the stones, will achieve as they soon journey together to bring the mystery to its conclusion. 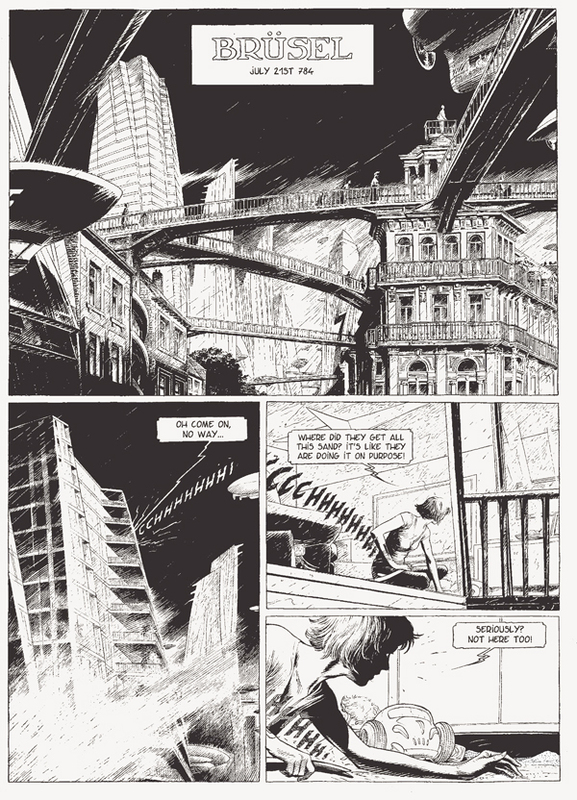 Integral to the series’ success is the art by Schuiten, precise and sprawling black and white renderings with a classical feel, focused on the space around the characters and the architecture that dominates it. The depiction of Brüsel are entirely realistic looking, which makes the more exotic and outrageous locations look even more stunning. Schuiten manages to bring everything down to earth with his work, which in turn sends everything to spiraling, fantastical heights in their depiction. Peeters and Schuiten have created an enticing universe that brims with depth and possibilities, and it’s exciting that this project will result in all nine volumes being available in English. This March will see the third release in the series, The Shadow Of A Man, and that promises more subdued, philosophical, disorienting adventure in the universe of the Obscure Cities and I can’t wait. Original article by John Seven, published at January 17, 2017. This blog post was created on 2017-01-28 at 13:31 and last modified on 2018-05-06 at 08:40 by Joseph Le Perdriel.